Location: At junction with Customhouse Street, on corner with Hayes Bridge Road, adjacent to ice rink. Public house; circa 1903 (date on tiles in bar). Two-storey public house. South east front of 6 bays (L bay is broader), plus splayed corner bay to R; 2 bays to sides. Red brick with yellow brick pilasters, aprons etc. 2 windows with curved heads to each bay on first floor with single cornice and aprons over; parapet above. On ground floor, elaborate tiled pub front with Venetian windows; green and gold tiling with raised lettering to fascias, tiled panelling to pilasters and stall risers. Saloon bar on ground floor at west end; walls lined with polychrome tiles; tiled floral frieze in relief. Bar with hard wood top and with external covering of tiles with grotesque pattern in relief. Engraved glass in doors and screen. Walls of entrance lobby, larger one of Cardiff Castle, dated 1903 and smaller one of Cardiff Town Hall; both by firm of Craven, Dunhill and Co, Salop. 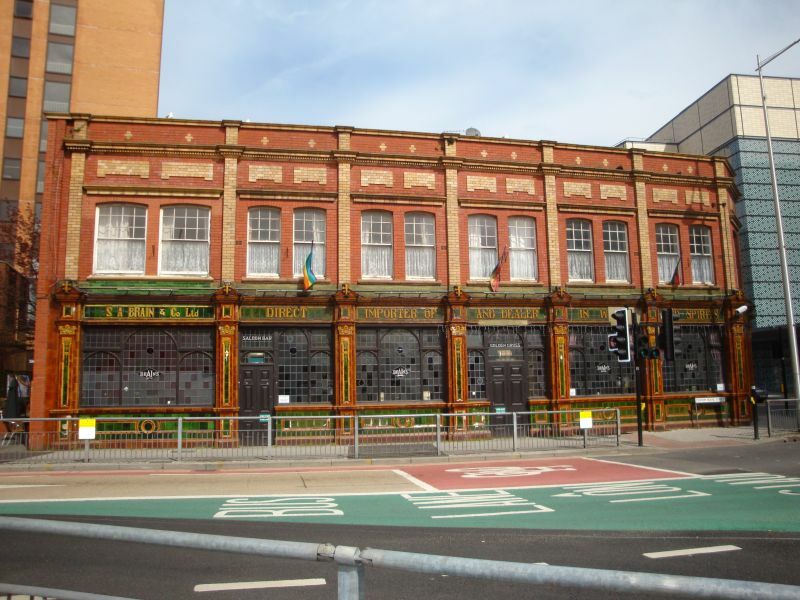 Striking public house, well-preserved, with particularly good tiles to facade and interior. To L of entrance block of Wyndham Arcade. On corner of The Hayes and Caroline Street. Skewed main frontage to Mill Lane which formerly faced the Glamorganshire Canal; Wyndham Arcade runs through to emerge as a passage at the S side of No 54 St Mary Street. To L (south) of Tabernacl Chapel.